Am 4. 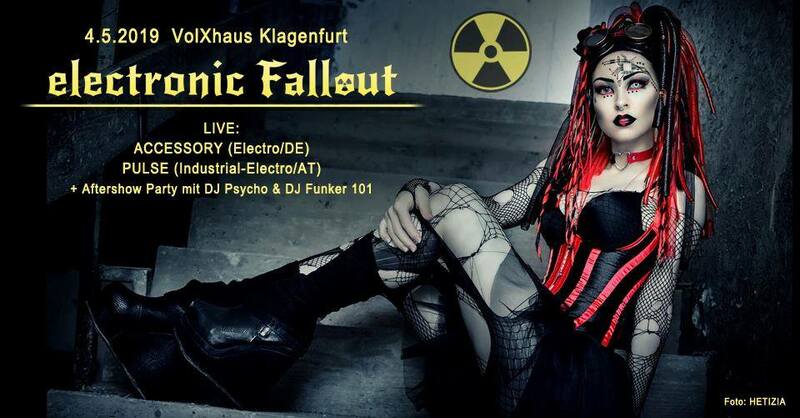 Mai gibt es endlich wieder ein #ElectronicFallout in Klagenfurt! Live beehren uns die Electro Ikonen Accessory aus Chemnitz und PULSE im Rahmen ihrer „Adjusting the Space“ Tour mit neuen Alben und fulminanter Live-Show im Gepäck! On May 4th „Accessory“ – one of the greatest Electro/Aggrotech bands for 20 years now is entering our stage with their new (8th!) album! Together with PULSE (Electro-Space-Metal) from Austria they are literally ready to burn down the house with fast and driving electronic beats and a great show! (Synthie) die Songs zu präsentieren. Accessory sind in den kommenden Monaten wieder Live quer durch Europa zu erleben. PULSE was founded as a soloproject from Nemesis beside his Black Metal Band ASTAROTH from Austria in the year 2000. Fascinated and influenced by the typical synthsounds of the 80s´ and such bands like PAIN, SAMAEL and THE KOVENANT which are trying to mix the style of diffrent genres too, Nemesis´ wish became bigger to create a mix of electronic based music with techno, industriel and metal influences. In fact of the activities of his band ASTAROTH, in 2012 Nemesis reactivated his project PULSE. At the end of 2013 he entered the studio with its mastemind Claus Prellinger to produce his first longplayer entitled „Extinction Level Event“. PULSE prefers a simple songstructure with typical synth and technosounds with industrial and metalelements to perform catching rhythms and melodies. The concept of PULSE is a deeper look into issues like religion, spirituality and the universe as well as evolution. In 2015 Nemesis summoned other musicians to form a full band. After a lot of concerts in Austria and also in the Czech Republic, including the „The ElectriCentrope Tour“, Pulse became a bigger grown fanbase. In November 2017 the band had its concert highlight as one of the main bands at Schattenwelt Festival in Vienna. 2019 Pulse will release their second album entitled „Adjusting the Space“! A tour through Central Europe lies ahead in May and June 2019.